I have been thinking about ‘change’ the last few weeks – individual and organisational change. The diagram above is the first visual draft of this thinking and I am sure that as my thinking on the subject evolves so will the diagram. I will appreciate feedback from you about it as this will help refine my thinking. Please use the comment section below. An individual is defined by his/her habits – habitual way of seeing the world, habitual way of making decisions and habitual way of doing things. Habits make it easy to function because they are default ways of operating. We are programmed by our habits. This is why it is difficult to change a habit. Habits tend to be replaced by other habits and not eliminated in a vacuum. The aim of positive change is to replace an unproductive or destructive habit with a good one. An organisation is a group of individuals with the purpose of accomplishing a specific goal or goals. Individuals have habits and a collection of individuals (organisation) have a culture. 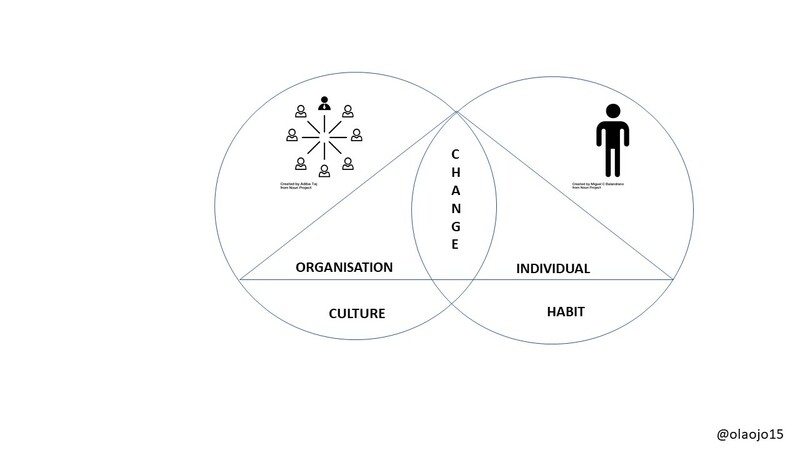 An organisation’s culture can’t change without some or all of the people in that organisation changing specific habits. This is why there is an overlap in the diagram above between the individual and the organisation. Change doesn’t just happen. Humans (habits) and organisations (cultures) by nature resist change because it is uncomfortable. Therefore, the need to change has to be triggered for it to happen. Something has to inspire or provoke the motivation to change. A trigger can be new information or pain/setback/loss or a pleasurable incentive/gain etc.